If you have a burning question maybe our FAQs can help? 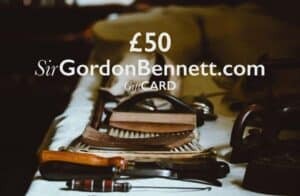 If you want to get in touch with us then email us at support@sirgordonbennett.com. We will do our damnedest in getting back to you within 24 hours during the week and on the following work day after the weekend. Or contact us via live chat Monday to Friday 9-5 to speak to someone more swiftly. Do you know a brand that would sit well with Sir Gordon Bennett’s ethos or have any other B2B enquiries? Email business@sirgordonbennett.com or or contact us via live chat Monday to Friday 9-5.